Sydney was born in London in December 1868, and in this account he is referring to early memories when he was five or six years old, in about 1874 or 1875. 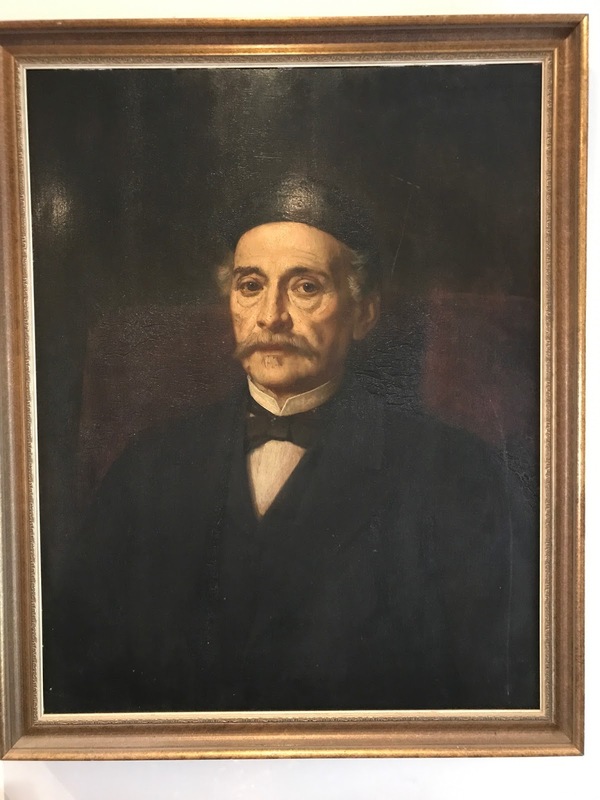 Samson Schiff was born in 1807and he would have been around 68 years old at the time of this supposed visit. His brother Leopold had died, I believe, on 30th June, 1868, hence the reference to his memorial in the garden. 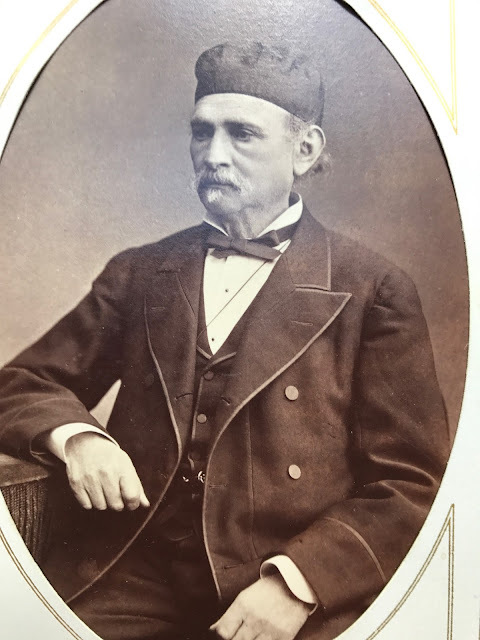 Samson Schiff died 22nd April, 1885, and is buried in Milan. Sydney Schiff was a friend of Proust, and closely influenced by him, though as he had apparently written this book before he met Proust it seems likely that he was attracted to Proust's writing because he recognised a kindred, if superior, spirit. I thinkj I am mistaken in indentifying 'Uncle Leopold' as my great great great grandfather Samson Schiff. I think now that it is much more likely that the uncle described here is in fact Joseph Wollheim. He was indeed uncle to Alfred Schiff and his siblings, but on the maternal side. I believe that Joseph, who was born in Lissa (now Leszno) in 1811, and who died in Vienna in 1891. I believe he never married, but his portrait in oils somehow came to the family in England. Uncle Leopold [ie Joseph] must be very, very old because he's papa's uncle as well as mine. He had his breakfast when we'd finished ours and after papa drove off to the station. He had the spare room on the ground-floor looking on to where the high trees were with the rooks in them and the round seat underneath. When I came in he always held his arms out wide and I ran in between them. Then he put his arms round me and made me stand between his legs and answer his questions. I didn't mind because I loved Uncle Leopold but I couldn't understand very much. He wore a round black cap and he had little bags under his eyes. His face all screwed up when he laughed and you couldn't see his eyes at all. His face was a funny yellow and covered all over with wrinkles. When I kissed him, I felt the short bristles with my lips; his skin was so nice and cool and so were his hands. He wasn't at all big and he was all bent up but you couldn't tell, when he was sitting at the table. He always had a glass of water and two lumps of sugar in a saucer and Johann, his servant, stood behind his chair. He said "Da" and pointed at the glass and I dropped the two lumps of sugar into the water. Then he stirred it and drank a little with the spoon in the glass and put his two fingers on his waistcoat just below where the buttons were undone at the top and said "Ah!" right down in his chest. Then I said "Gut?" and he nodded his head up and down and said "Gut." After Johann gave him his coffee, he rolled up a cigarette and let me strike a match but he made me hold it to a thick round yellow string in the box and blow, and he lit his cigarette from it. We did that every morning. There was a black leather pocket-book with an elastic band round it on the table and every morning he put his glasses on his nose and took off the band and took out a sheet of paper with a lot of names on it. While he smoked, he put his middle finger, the one that was so brown, on the paper and followed the names down with it till about half-way and his white cuff with a large round gold stud in it came down over his knuckles. Once I asked him what the paper was about and he said " Geburtstage. Heute muss ich deine Tante Julia schreiben." When he said "Aufwiedersehen Richard [Sydney]," I knew it was time to go and at the door I waved my hand to him because I knew he was watching me through the little bags where his eyes were. When I turned round I could see his white socks and slippers under the table but he wore high boots under his trousers when he went out, nearly up to his knees. Johann had been a cavalry soldier and he gave me my first riding lessons. He walked beside my pony, pressing my knee to the saddle and my toes inward. We went down the gravel path to the Observatory and round it, then back the other way to the seat under the high trees where Uncle Leopold sat with mamma and she held her sunshade over him. Afterwards Johann took the pony to the stable and mamma went in. Uncle Leopold held my hand and we walked very slowly to the summer-house where the Memorial was. Out of doors, he wore a straw hat with a wide brim and a very narrow black ribbon and he took it off when we got to the summer-house. I knew the Memorial was to grandpapa but I couldn't read the inscription because it was in German. Uncle Leopold read it out loud and made me repeat some of the words. He went to the Memorial every day and sometimes Johann pushed him in his wheel-chair. Every evening when I and Sissy came down after tea, Uncle Leopold danced me on his foot but papa used to stop him doing it and danced me himself because he said it tired Uncle Leopold. But I didn't like the way papa did it so much. Uncle Fred danced me best of all. They all sang the same words and I know them by heart and the tune too. Sissy never liked being danced and she never learnt the words but perhaps when baby gets older she will, like me. It was her first birthday the other day and while I was standing by mamma's bed saying good-morning, papa brought in a little box with cotton-wool in it and a pearl in the middle because baby had got two teeth and he said some day when they come out he's going to have them made into a pin to wear in his tie. Here is another clue to the date of this visit. Sydney's sister was born 27th May, 1874, so this last paragraph would date the visit to 1875.